Love cheesy cheddar but looking for something better? Try Solar Raw Better than Cheddar Kale Chips for that cheesy taste you know and love. This version is made with garden fresh kale smothered with sweet red bell peppers and creamy cashews – one taste and you’ll know why its better! Solar Raw Food™ is committed to providing the highest quality Raw Food products in the most responsible manner. Their kale is grown organically, and seasoned on site with only the freshest raw ingredients. Located on their Canadian family farm, the kale chip facility operates on the sustainable power of photovoltaics Solar Energy. Leafy greens, like these kale chips, are a great stress-busting food. To learn more about foods that help to relieve stress, check out our blog. Ingredients: Fresh kale*, pre-soaked cashew nuts*, pre-soaked sunflower seeds*, fresh red bell pepper, coconut sap* (Coco-Natura™ - low GI), Engevita® nutritional yeast, lemon juice, Lumière de Sel® Himalayan Salt. *organic. Contains nuts. If zero stars was an option that is what this product would get. So disappointed. This products was dust, and very horrible tasting. It has a weird aftertaste and unpleasant mouth feel. They donâ€™t taste like cheddar, they donâ€™t taste like kale and I highly do not recommend this product. Love these kale chips! Not full of salt and processed oils. My favorite flavour right now. Really good flavour and not baked and loaded with oil and excess calories. My family loves these kale chips! The best! Not salty. Pretty pricey but very yummy! By far the most delicious kale chips I've tried. Really cheesy flavor!!! I love all these flavors. I haven't gotten to try dill, though. I can't find them online and I live in the states. Tried them all...THESE are the best on the market. Low cal, low fat, no sugar and cheesey...however, the problem with ALL kale chips is that a lot of it EASILY turns to "dust" on the bottom of the bag so careful in handling the bag. PLUS...they tend to adhere to your teeth, so watch your smile before you you leave the house. I tried one of these chips and spit it out. I was so disturbed by the flavour and texture of the chip. I can definitely make my own kale chips better than this...it was not worth the money for me. I unfortunately was not a fan. Very yummy. Tasty snack and have a strong flavour, so I tend to not over indulge. Kale and cashews really are a delicious blend in this package. They are very rich so I wasn't able to eat a whole lot at one time. I started eating Solar Raw kale chips while doing a slow carb diet. 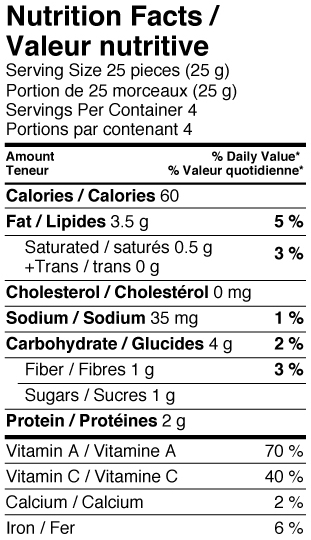 There is only 1 gram of sugar in these chips, which isn't bad. The list of ingredients is all-natural, and I particularly love the Better Than Cheddar for it's non-dairy cheesiness. The little bits of cashew in the chips are an added bit of deliciousness. These are very good, although expensive. The bag was somewhat crushed, so I used some of the chips sprinkled on a salad - very good. If you're a lover of cheese and kale (like I am), you'll love these! Trust me. I wanted to try these after hearing others talk about them. I did not like them very much, and they don't give you much in the bag. These tasted fine...and I rarely get indigestion but these gave it to me really bad! 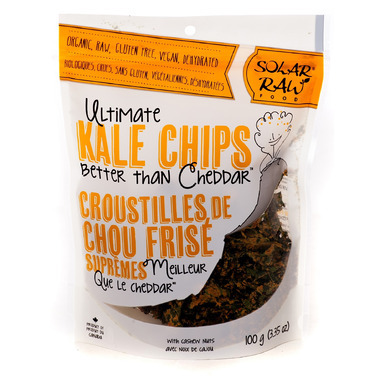 I like the taste of the Kale chips "better than cheddar". A little expensive for me but I will buy them again in the future. Very tasty kale chips if you like pepper. I couldn't stop eating them and finished the whole pack in one sitting. I always rely on reviews for the purchase of my products. I don't understand why this product got a 5star review. It's really really not good according to me. It truly tastes yucky. However I still give it two stars because it's a healthy choice. These are amazing! Best kale chips I've ever had! Yummy kale chips! I have yet to try the other flavor. Can't wait!